Posted 1st February 2017 & filed under Blog, Higher Education, Intergenerational Justice, Student Loans, Young people. On 19 November 2016, parents marched alongside students in a national protest against the unfair system of higher education. Among them was Ian Wells, a 62 year old parent who is becoming increasingly worried about the impact of future student debt on his daughter. 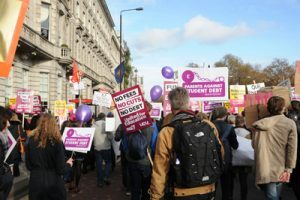 Together with IF, he set up the Parents Against Student Debt campaign, which seeks to give a voice to the concerns of parents, and encourage them to join the fight for a fairer deal. Now is the time for parents to act. Students are finishing university with staggering debts of £50,000 or more. The interest rates on student loans are above market rates, amounting to RPI+3%. To make matters worse, this interest is compounded – meaning that it stacks up month by month, right from the moment the loan is taken out. When it comes to repaying these loans, the situation is no better. On top of basic-rate 20% income tax and 12% National Insurance, students earning more than £21,000 give up 9% of their income above that figure to repay their student debt. This means that even low-earning students face an effective 41% tax burden. Although individual student debt gets wiped after 30 years, this is no comfort for those wanting to put a deposit on a property, or generally save for the future. Along with this debt comes a heavy psychological burden, especially when students consider that the terms could be changed at any time. And four years after the initial £9,000 tuition-fee hike, the costs of higher education are rising yet again. From 2017, students face paying £9,250 per year, as the government has lifted the cap to permit an increase of 2.8% in line with inflation for 2017/8. When compared to our parents’ generation – where a university education came with none of this baggage – this current situation seems even more unjust. So the “Parents Against Student Debt” campaign raises an important question: how exactly can concerned parents support students, and make their concerns known? As well as joining the campaign, they could write to their MP to protest against further fee hikes, and encourage others to do the same. Taking action could also consist of something as straightforward as opting for a student-friendly party in the voting booth. Just a part of “student life”? However, not all parents recognise the costs of higher education as an injustice, or something which concerns them. Many believe that their financial contributions towards student living costs are higher than they should be, with two-thirds of parents believing their children are not finding the best deals. What should these parents know about the true price of university? There is a familiar image of student life as the time where you are at your most thrifty and innovative. In popular culture, university means simple meals (often coming from cans), cheap drinks, and less-than-luxurious surroundings. “Autonomy and spontaneity” are considered a necessary part of the university experience. Of course, this is in part true. Leaving the comfort and security of the family home is an essential part of what makes university a valuable thing to do. However, we must not let stereotypes of “student life” romanticise a situation where students are being treated unfairly. The excessively high costs of studying have reached the point of a political injustice. Parents might sometimes jump to the conclusion that if their child needs financial help during term time, this is the result of a frivolous or careless use of money. However, the real living costs of university – which includes necessities such as books, travel, printing, photocopying, internet access, electricity, as well as food and rent – are at an all-time high. According to GoCompare’s Degree of Value rankings, the total cost of the first year of university at Imperial College London is a whopping £26,432. To make matters worse, in 2015 maintenance grants were scrapped and replaced with maintenance loans. These grants had been given to students from lower-income households to contribute to their living costs, and didn’t need to be paid back. The new maintenance loans are similarly means-tested, and based on your household income. This system therefore assumes that the more your parents earn, the more they will subsidise your living costs. For instance, according to a calculator produced by Save the Student, a family with an average household income of £40,000 would be expected to cover £1,767 of the living costs per year for a student living away from home outside of London. Parents should be aware that their financial contributions are built into calculations of how much money students receive. This is one important way that parents are directly implicated in the system of student debt. Thanks to student debt, an increasingly competitive job market, and rising house prices, more and more students are having to rely on their parents long after they’ve graduated. This may not be something that parents had budgeted for, and so it’s inevitable that some will be feeling the strain. A report by Hitachi found that 29% of parents whose children have been to university have had to sacrifice major purchases in order to support them. The burdens placed on parents make student debt an intergenerational issue. This should give parents and students the motivation to unite in the face of this situation. In a political climate where the gap between older and younger generations seems more stark than ever, with the 2015 general election and the Brexit vote showing a dramatic division in voting patterns between these two groups, it is crucial that parents and students find a way to bridge this gap. Confronting the rising costs of university together is an important way to present a united front. To show your support to this cause, join the “Parents Against Student Debt” campaign. Visit the web page for more details.